Whether you need help treating a cavity, whitening your smile, or replacing one or more teeth, our team at Estrada Dentistry can help. For over 25 years, we have offered a comprehensive range of dental services at affordable prices in a comfortable, state-of-the-art atmosphere. We’re confident that our dentists can treat your most pressing dental needs and always leave a smile on your face. In order to provide the highest quality dentistry, you have to have the right tools. At Estrada Dentistry, our office is filled with the latest dental technology to help us do everything from diagnostics to treatments in with more speed, precision, and comfort. You’ll be amazed at how we’ll be able to make your appointments fly by thanks to our technology. You deserve the very best when you come to see us, and our high-tech approach will help you get just that. 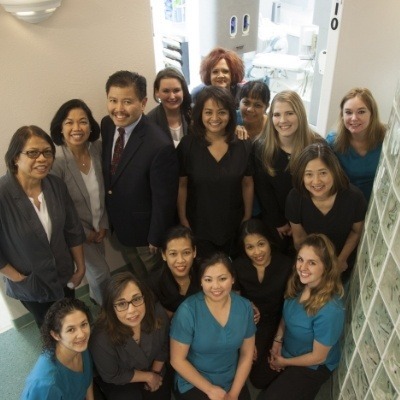 Our practice is led by the husband and wife team of Dr. Craig Estrada and Dr. Charito Mangaya-Estrada, and every day, they come together to serve Chesapeake smiles. We’re happy to welcome entire families through our doors, so feel free to bring your children, yourself, and your parents to get the healthy, beautiful smiles you deserve. With us, you’ll get all the warmth and service of a small, local practice as well as the quality and treatment variety of a large one. In the end, quality is our main goal. High-quality dentistry looks better, lasts longer, and helps you avoid a multitude of preventable dental problems to keep your smile looking and feeling its best as the years go by. No matter what brings you to us, we’ll only use the latest technology and highest-quality materials to take care of your smile. Whether you need a simple checkup and cleaning or an advanced restorative procedure, you can trust that it will do wonderful things for your smile. Of course, our patients are more to us than just sets of teeth, which is why our team works hard to take care of you from top to bottom every time you come to see us. Our staff is friendly, welcoming, and they’ll make sure you always feel comfortable in our office. Our doctors are ready to answer any questions you might have, plus we’ll go out of our way to make any special accommodations you need to better enjoy your dental experience. Every smile we see is completely unique, and our approach to dental care reflects that. Thanks to our wide variety of services, we’re able to better personalize our patients’ care so they can always get exactly what they need. And, because of our dedication to technology and education, we’re able to perform many advanced services in-house in addition to traditional general dentistry treatments. Basically, we’ll be your one-stop source for all things smile-related so you can always work with the doctor and team that you trust. Just because we offer the best service and care in Chesapeake doesn’t mean it shouldn’t be affordable as well. Our practice is extremely insurance-friendly, and we’ll gladly accept your plan and even handle the entire claims process to make sure you’re getting the most out of your benefits. Or, if you currently do not have insurance, we can help you get hassle-free, low-to-no interest financing as well. In the end, we’ll work with you to make sure you can always come to see us with peace of mind.